When we say any sports game qualifies for Game of the Week, we mean it. That goes for Ganbare Dunk Heroes, in which Kotaku reader Skutarth finally triumphed over those no good hicks on the "Texas" squad. 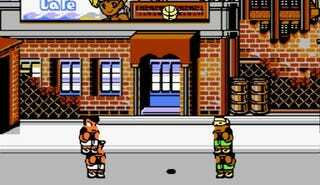 For those not familiar, Dunk Heroes is "essentially River City Ransom Basketball," as Skutarth says. Released for the NES/Famicom in Japan only in the early 1990s, it's a 2-on-2 hoops throwdown which features powerups, weapons and fighting. There's a campaign mode through which your team upgrades its talents as you progress. Your team's home court is at Niagara Falls. Opposing sides include New York, Florida, Hawaii and San Francisco, whose players are stereotyped to their region. Skutarth says he finally beat Ganbare Dunk Heroes for the first time after buying it several years ago. "It's fortunate that Nintendo put Famicom converters into some of their old US cartridges so that I could plunder one for this game," he writes. He sat down to beat it in a day, saving the toughest team - Texas - for last. "After playing them a staggering 8 times and losing every time, I finally had my lucky break," he says, though he trailed 21-12 after the first half. "They kept knocking me out of the air, making it near impossible for me to score more than one basket in one shot. Only while playing Texas do I ever have that problem. All of their attacks seem to hit everything a person and a half high," he says. "Partway into the second half, I finally got my lucky break. Our team's bottom basket fell off and I successfully threw it onto their side," he says. "The last score of the game came about 20 seconds from the end, and it was a super throw the AI partner made that went through all four baskets, earning us 12 points making us win with a final score of 61 – 40," says Skutarth. Now it's my turn to say what we so often read in comments on sports posts. "I have no idea what any of those words mean. But it's a triumph in a difficult sports game, and off the beaten path enough that it gets GOTW status. Here's the proof! The biggest game today is on a backwater network -No. 4 TCU visits No. 6 Utah and the game is broadcast on something called CBS College Sports Network. I don't have it, but I'm guessing there has to be some web presence here. The second best game is No. 5 Alabama at No. 12 LSU, which is 3:30 p.m. on real CBS. No. 22 Baylor, a surprising contender for the Big XII South division title, visits No. 19 Oklahoma State, that just kicked off 90 minutes ago on Fox Sports Net. Your nightcap is either No. 13 Arizona at No. 10 Stanford or No. 14 Missouri at Texas Tech, both at 8 p.m. Depending on where you live, one will be on ESPN, the other will be on ABC. Best games: Tampa Bay is in a show-me game at Atlanta (1 p.m., Fox); both teams are 5-2. Miami (4-3) travels to Baltimore (5-2) under similar circumstances (1 p.m., CBS.) A third overachiever, Seattle, will find out who it is when the 5-2 Giants come to town. The Shitchickens are unbeaten at home though. That's 4:05 on Fox. Then the surprise power elite of the AFC West, Kansas City and the Raiders, lock horns at 4:15 p.m. In NBC's Sunday night game, Green Bay is the latest tour stop for the Dallas freakshow. Monday Night Football is Pittsburgh at Cincinnati. All local broadcasts, but your best games are Denver at Dallas tonight, 9 p.m. and tomorrow, Celtics are at Oklahoma City (7 p.m.) and the Lakers host Portland (9:30). The CBC's Saturday games are Buffalo at Toronto or Ottawa at Montreal (7 p.m) followed by Detroit at Vancouver in the 10 p.m. nightcap. WGN has the Oilers-Blackhawks tomorrow, 7 p.m. If you like watching people exercise, it's on same-day tape at 2 p.m. tomorrow on NBC. The second leg of the MLS conference semifinals between Seattle and Los Angeles goes off at 9 p.m. on ESPN.